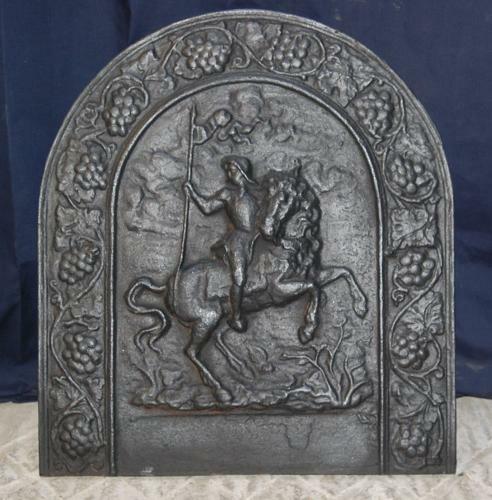 A very heavy and attractive, reclaimed, reproduction cast iron fire back that has possibly been made in Spain. The fireback has a pretty design with an arched top and cast border with repeating grape and vine design. The casting is deep, giving the fire back a 3D effect. The central design is believed to be a reproduction of an original antique design of a Spanish king. The item can be paired with a fire basket or large fire dogs that could support logs. The fire back is quite thin and would be suited to light burning. The iron has been blacked and polished and has a rich colour and finish. The fire back is reclaimed and has some slight signs of use and wear. Surface rust to the back and some very small patches of surface rust to the edges and design. Some very slight knocks, scratches and casting marks and a small mark to the left side of the base edge. A very attractive and well made fire back, ideal for a cottage or period property. Width 52.5cm (approx.) Please check with us that this will fit with your fire basket.